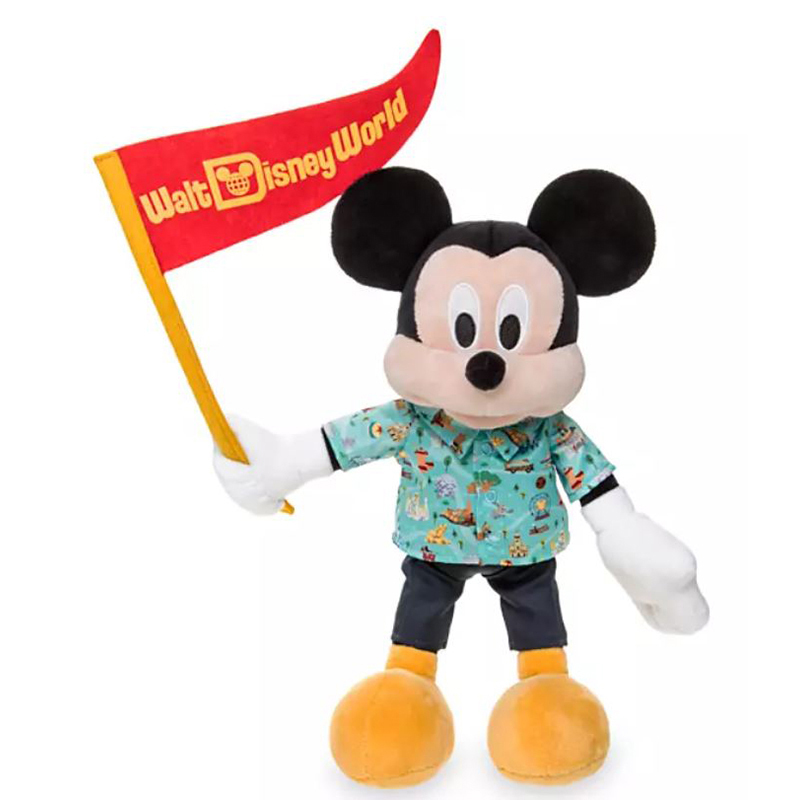 Welcome to Your WDW Store's Disney Character Spotlight! In this edition, we're going to discuss one of Disney's wildest heroes: Simba, a lion cub destined to be King of the Pride Lands, and his friends Timon and Pumbaa, a self-centered yet loyal meerkat and a gassy yet steadfast warthog. Simba and friends made their debut in Disney's 1994 blockbuster The Lion King, and also appeared in the sequel The Lion King II: Simba's Pride, The Lion King 1½, the Timon & Pumbaa TV series, and more. We first meet Simba as a newborn cub being presented to the animals of the Pride Lands as the heir to Pride Rock, the Lions' royal throne. He grows into a rambunctious young prince who "Just Can't Wait to be King." But Simba doesn't understand the responsibilities of kingship and only wants to be in charge so he doesn't have to follow the rules set down by his parents, King Mufasa and Queen Sarabi. He hates being supervised by Zazu, a hornbill bird who serves as Mufasa's majordomo. Simba spends most of his time learning from Mufasa, playing with his best friend Nala, and visiting his sinister uncle Scar. 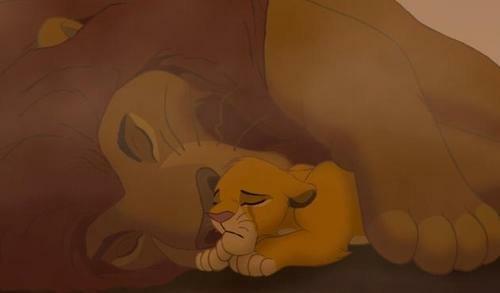 What Simba doesn't know is that Scar hates him for taking his place as next in line for the throne. Scar begins plotting against the young prince, whose desire to prove his bravery makes him easy to lure into danger. Eventually, Scar and his hyena henchmen manage to trap Simba in a wildebeest stampede, in which Mufasa is killed. 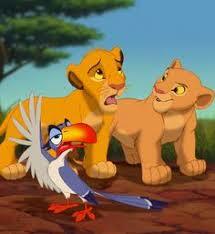 Scar then convinces the heartbroken Simba to run away, believing that his father's death was his own fault. Simba flees the Pride Lands, evading the hyenas Scar sent after him but collapses in the desert. It seems all hope is lost, but Timon and Pumbaa come to the rescue. They quickly become Simba's best friends, teaching him their "Hakuna Matata" philosophy: no worries about the past, present, or future. Simba grows up in a lush jungle with his new friends, living off their favorite food of bugs and grubs, and leaving all his worries behind. His carefree life is shattered when a hungry lioness attacks! Simba wrestles with her and recognizes her as Nala, who had left the Pride Lands to find help. With Mufasa and Simba gone, Scar took the throne and let the hyenas take over, leading to terrible conditions. Nala is overjoyed to find Simba alive, but she doesn't know that Simba blames himself for the death of Mufasa, and doesn't understand why he refuses to return to the Pride Lands. 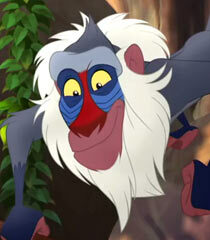 But Simba also encounters Rafiki, the old baboon shaman who was present for his birth. Rafiki brings forth an image of Mufasa in the clouds, and at last Simba understands that his father lives on in him. Simba, Nala, Timon, and Pumbaa then head for the Pride Lands to save the kingdom from Scar. 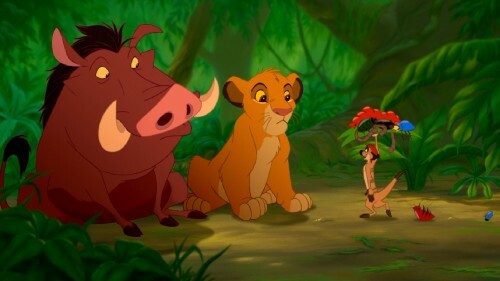 With clever planning and a hilarious hula dance distraction by Timon and Pumbaa, Simba is able to confront Scar. The truth comes out about Scar's evil plots, and the matter is settled with an epic battle… and some hungry hyenas that Scar mistreated one too many times. What is the pride up to now? Simba, Timon, and Pumbaa are some of the most popular Disney characters today, proving that you don't need to be a princess to make it in the Disney world. Timon and Pumbaa got their own TV show, as well as appearing in later media along with Simba, like the Kingdom Hearts video games. There was the iconic Lion King game on Sega and Gameboy back in the 90's. Now, Simba is all grown up with a couple of lion cubs of his own in charge of The Lion Guard, a team that protects the Pride Lands and defends the Circle of Life, on Disney Junior. And in 2019, we're going to have a chance to see these beloved characters in a whole new way, with the release of the CGI remake of The Lion King (similar to the Jungle Book remake). If you're a big fan of Simba, Timon and Pumbaa, Nala and other Lion King heroes, you're in luck. At Your WDW Store, we have tons of Disney park-exclusive The Lion King merchandise featuring all your favorite characters. Pins, apparel, mugs, figurines, posters, and more are all ready to join your collection, so take a look!